Going for a walk is the simplest of activities. No equipment is needed, no planning, and not even much time. 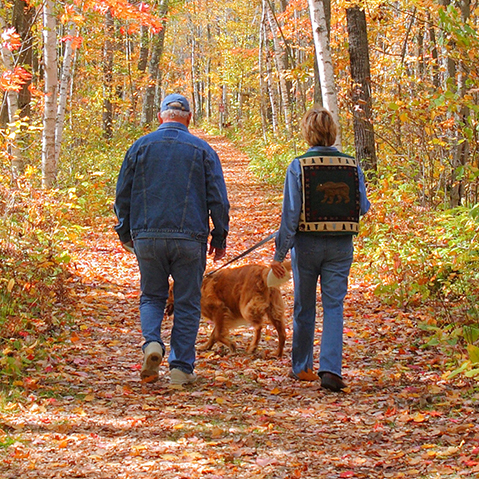 Walking is also an excellent form of exercise, a brilliant stress reliever and a fail-safe mood booster. A good brisk walk, or a gentle, appreciative amble, can put the world in perspective and soothe your frayed nerves. So today, take a break from everything that just has to be done and go for a 15-30 minute walk. You don't have to go anywhere special – a walk to the shops, a circuit of the local park or a country footpath can all have the same positive effect. Try not to rush, but walk as mindfully as you can, with awareness on your feet as they land on the ground, the movements of all the muscles in your legs. Pay attention to the sights, sounds and smells around you. Maybe there are seasonal deep reds and greens in the plants and bushes, or perhaps the shades of grey and black in slush, snow and roadways. Try to be open to all your senses so that smells, the feel of rain or breeze on your skin and patterns of changing light and shade all make up the experience of your walk. You’ll return energised, satisfied, ready to put new vigour into what needs doing next.